So you want to jump into Social Media Sites,And corner your Niche Market with Article Marketing?! SOCIAL MEDIA! SOCIAL BOOKMARKING! SOCIAL **MARKETING**! NEWS ABOUT SOCIAL MEDIA IS BURNING UP THE HIGHWAYS OF THE NET! I know you are thinking, How can I get started...TODAY? Marketing with Social Media sites can generate huge visitor traffic to your website or blog, as your articles get published and syndicated across the world. What does this mean for you? Its Money In The Bank! Awesome News For Your Business, Right? Many people need guidance when it comes to learning the basics of enabling the power of Social Media and Marketing, and books are a great way to learn. You just have to be careful that you are purchasing a book from a genuinely successful Social Media participant, and not someone who can paint a pretty, simple picture of networking, communicating, and marketing steps because a pretty, simple picture is not what Social Media and Marketing is about. So where do you go to get the RIGHT information to kick start your Social Media and Marketing Adventure? You have arrived at the right place! This book will quickly bring you up to par for getting your Social Media Plan of Action going strong! * Can Social Bookmarking Help Me? * Social Networking - The Next Great Marketing Medium? NEWSFLASH: It is ALREADY HERE! Are You Seeking The BEST Information For Successful Article Writing using Social Media Marketing? Imagine that! I am only a click or two away from close to 13,000 other people who share my similar interests ranging from what I like to watch on TV, to work I could provide to them. 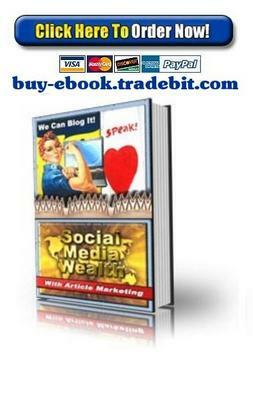 ...In This Book, This Social Marketing Info Will Take You To The Top Of The Success Mountain! Remember: The Secret To Winning At The Social Media and Marketing Game Is Not Rocket Science! In other words, this is such a terrific deal for YOU! Your purchase today will ensure that you are getting the best, most current Social Marketing information at this incredibly low price $1.99!